As a busy parent, you know what it’s like to “hit the wall” and get left feeling wiped out and even a bit “hangry” (where hungry meets angry) at times! It’s bound to happen when you’re running around attending to all your responsibilities. But this is a critical time to make the right choice so you don’t jeopardize your fitness. When that mid-afternoon slump hits, don’t head for the vending machine. While those rows of chocolaty goodness might seem like a surefire way to get some energy back, there are much better options available. Here are 10 fantastic natural foods that will give you lots of energy for the long haul. Bananas will satisfy your sugar craving. They’re filled with it, but they also provide you with fiber for energy that lasts even longer. Bananas are an easy snack to bring along with you, or you can have them with cereal. Almonds are another convenient snack to keep around. The boost they give you comes from the protein, copper, manganese and riboflavin they contain, which help your body produce and maintain energy. Eggs give your body an enormous supply of protein in one sitting, which is great for your energy levels. Hard-boiled eggs make good snacks, or you can fry or scramble a couple for breakfast. Spinach provides you with plenty of iron, which your body needs to make energy. You don’t have to eat it straight out of the can Popeye-style. Instead, have a salad with spinach for lunch or dinner. Brown rice is filled with energy-producing manganese, which should keep you going for a good part of the day. Pair it with protein, such as chicken, for an added power boost. Apples make great snacks that give you some much needed energy thanks to the fiber they contain. Fiber takes a while to travel through your digestive tract, so you’ll enjoy a solid energy boost for a long time. Salmon is packed with healthy fatty acids, protein, riboflavin and vitamin B6, which translates into a big supply of energy for you. Enjoy some grilled salmon for dinner or a salad with salmon for lunch. 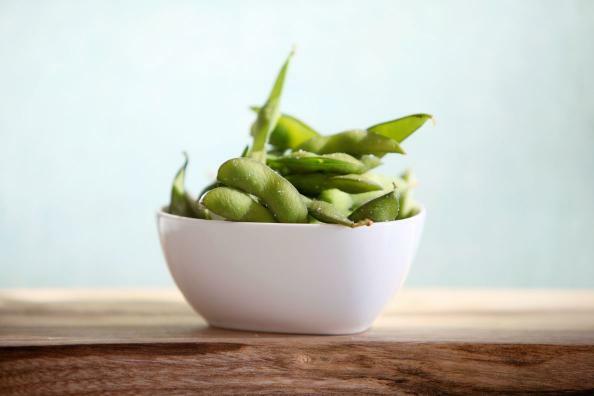 Edamame could quite possibly be the perfect food to eat when you need some energy. It has an ideal blend of fiber, healthy fats, protein and complex carbs for energy that will keep you going and going. Skip the sugary cereals and enjoy a bowl of whole grain cereal instead. Whole grain cereals have fiber, protein and complex carbs. Stick to ones that are fortified with iron for even more energy. Yogurt works as an afternoon snack or a breakfast-on-the-go when you need more energy due to the energy-producing magnesium it contains. The author Sandy Getzky is an associate editor at ProveMyMeds, a public health and education startup focused on producing helpful resources concerning the treatment of common ailments like stretch marks and toenail fungus.